Welcome To Flat! There’s a lot of you out there: Flat, Alaska - Flat, Missouri - Flat, Kentucky and Flat, Texas. We’ve got you covered here at Halstead with our 14/20 Yellow Gold Filled, 14 Inches Finished, 1.6mm Flat Cable Chain with a Spring Ring on the end. A real golden opportunity of a chain. 14 Inches is an unusual size, but if you are making children’s necklaces, this is the perfect size for your jewelry supplies. 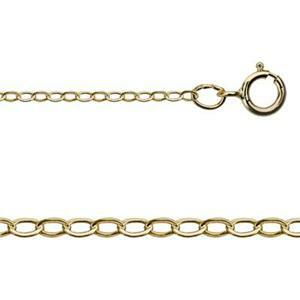 Used this chain with three dainty charms for a flower girl gift, length was perfect and quality of the chain is great. The cable is strong enough to support charms yet delicate looking. Customer was thrilled.